Fallen From Proust, a new play by by Norman Allen, is an entertaining comedy about relationships. Its fast-paced, clever dialogue is reminiscent of Oscar Wilde&#146;s The Importance of Being Earnest. Like Wilde&#146;s comedy of manners and satire on Victorian society, Fallen From Proust tackles issues of truth, honesty, and identity. Unlike Earnest, Fallen explores a full spectrum of sexual relationships that Wilde, a homosexual who landed in prison because of his orientation, was unable to write about in his time. Set in two acts, the story of Fallen From Proust focuses on Michelle, a thirty-something woman who can&#146;t get her boyfriend, Gary, to commit. As the play opens, Michelle is escorting Roger, a new housemate, into Gary&#146;s place, a cottage in Sausalito looking out over San Francisco Bay. Michelle, who does not live with Gary, instructs Roger that he must become her accomplice in helping her to get Gary to walk down the aisle to wedded bliss. Michelle, who is not a laid-back California girl, probes Roger and gets him to show her everything he&#146;s got (or so she thinks). Picking up his bags, Roger eyes the front door but then he dumps the contents of his two suitcases out on the floor. Among his possessions is a book by the French modernist writer Marcel Proust, which Roger gathers up quickly not wishing for Michele to see. However, Michele is already impressed with his taste in literature, which contrasts significantly with Gary&#146;s. Gary is a writer and publisher of children&#146;s literature. In short order, Michele and Roger become best friends telling each other their deepest wishes. To an outside eye, the relationship between Michelle and Roger is acceptable because Roger tells Michelle and Gary upfront that he is gay. By the end of the second act, a third man named Alan shows up at the house to inject a new order of truth for Michelle, Roger, and Gary. Because surprise is an important aspect of the play, no further details should be told. According to playwright Norman Allen who established himself with two award-winning dramas&#151;Nijinsky&#146;s Last Dance and In the Garden, &#147;People hear the title [Fallen From Proust] and they think they&#146;re in for something heavy, but in fact the title just refers to a prop that becomes central to the plot.&#148; Toward the end of the play, Michele takes from Roger&#146;s book by Proust a document that reveals a crucial secret about Roger. While it is true that the audience need not know anything about Proust to enjoy Allen&#146;s play, the invocation of Proust and his monumental novel (Remembrance of Things Past) about love and relationships (both hetero- and homosexual) creates a meaningful vibration in the landscape of Fallen From Proust. Another veiled intellectual reference that playwright Allen makes comes through the character of Alan who explains how the silence that occurs after a group of nuns are beheaded in an opera that he does not name [Dialogues of the Carmelites] relates to the disconnect he as a prostitute experiences with his clients after a sexual encounter. From this odd and unexpected analogy, Alan goes into a rap about how everyone has a black hole of need inside. Again, the playwright offers another artistic reference that an audience does not have to know, but nevertheless enriches the context of Fallen From Proust. Guest director Will Pomerantz has had fun directing the play. For example, when Michelle and Roger first enter the play, they do so in a choreographed manner that then erupts into rapid-fire repartee as Michelle circles Roger trying to understand why Gary has invited him to be a housemate and also considering how she can use Roger to leverage her relationship with Gary. After Michelle reveals that Gary has his microwave, stereo and window curtains controlled by a single remote clicker, Roger, left alone, experiences a Sorcerer’s Apprentice moment where the technology gets out of control. Then Gary, master of the clicker, arrives home from a red-eye flight and the action slows down into a more comfortable pace without the stylized action. Hope Lambert as Michelle, Michael Glenn as Roger, Damon Boggess as Gary, and Daniel Firth as Alan all create credible flesh-and-bone characters. 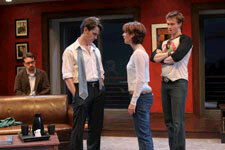 The playwright has provided enough information about each to give them emotional depth.